business traveler with luggage waiting for his flight. As the business owner of a growing venture, I never experience the same schedule twice. With that in mind, I know first-hand as a dietitian that it can be challenging to stay on track with a healthy lifestyle - particularly when you're in a business sprint. It's not a secret that diet, fitness, mind-body balance and sleep are leading factors in maintaining a healthy lifestyle. My lifestyle equation has always been energy = food + fitness + sleep. When you practice healthy eating, combined with a fitness strategy and restful sleep daily, it prepares you to deal with the stress life throws at you. With many functions to attend and restaurant options during business travel, I need to be wary of over-consuming. If I'm at a hotel for more than two nights, I ensure there is an in-room fridge or mini-kitchen so I don't have to rely on restaurant food and large portion sizes. This works well for me. For example, I stock up on delicious premade quinoa salad, Greek yogurt, sunflower seeds, almonds and fresh fruit from the local grocery store, making it simple to have a quick, healthy breakfast each morning in my hotel room after I work out. For more expert advice for this post I turned to the amazing Barbara Ficarra, RN, BSN, MPA. She is a registered nurse, health designer™, health educator, international speaker, Huffington Post contributor, award-winning broadcast journalist and founder of Design Your Healthy Life™. With Ficarra's demanding schedule a consultant, writer, and lifestyle and health expert, her healthy lifestyle hacks for busy entrepreneurs are based on a wealth of first-hand experience. Ficarra explains, "Research shows clutter can contribute to stress, but whether your style is a minimalist style, traditional, transitional, contemporary or country style, keep clutter at bay." I agree with this one - so much so that I had a professional organizer help me make my office more streamlined and organized. Next, Ficarra suggests making physical activity and exercise part of your office day. "Don't sit for too long. That's easier said than done, especially when you're in the midst of writing or working a project that has your full attention. Every 15 or 20 minutes get up and move. Set a timer to get up, move, walk around the office and stretch. If you're able to, go outdoors and go for a walk. It can help decrease stress. To get your moderate-intense exercise in during the day, choose the best part of the day that works for you. Aim for 30 minutes five days per week." Ficarra identifies that an entrepreneur's schedule can be challenging, making it important to plan out your meals and prep in advance. Salads are her favourite go-to lunch. "I'll prep in advance. I'll wash and dry the different greens - kale, spinach, romaine lettuce and arugula - and I'll chop the carrots and radishes, then all that needs to be done is to add the dressing. Sometimes I'll add walnuts and even chickpeas. The best part about a salad is that you can add whatever you like, but keep it healthy. I love avocado toast, too. It's so simple. I take 100% whole-grain bread, toast it, and top it with avocado, fresh tomatoes, fresh basil and a dash of salt and pepper. Get creative - sprinkle it with flax seeds or chia seeds or add nuts." Ficarra and I agree one of the best parts about being an entrepreneur is the traveling and the people that we meet. However, it can be exhausting. 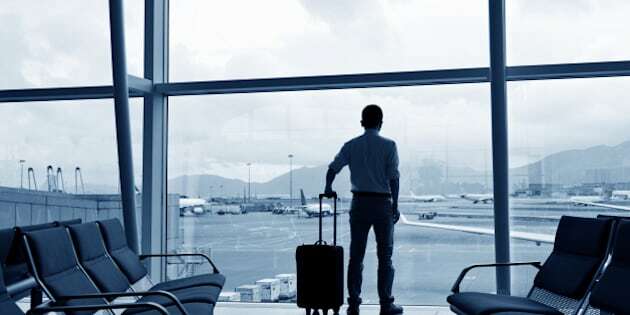 Ficarra's healthy design tips for both air travel and hotel stays will give you a much needed boost when away from home. Ficarra recommends staying hydrated. "In the airplane, there's not a lot of moisture in the air; the humidity is low. The re-circulated air can wreak havoc on your skin. It's very drying. When I get through security, I head to the nearest store and purchase large bottles of water. Of course, you can also ask the flight attendant for water, too. I always carry hand-sanitizer with me. That's the nurse in me. The simplest way to prevent the spread of infection is by proper hand washing. But, hand-sanitizers work well in case you're not near soap and water." Ficarra also reminds us to take packets of healthy snacks like roasted chickpeas or hummus to keep you fueled on long journeys. When I travel, I always pack my travel trio for the hotel. It includes an eye mask, ear plugs and mini-lavender soaps. I'm very sensitive to light, sound and smell, so all three are useful for me to get a good night's sleep. Ficarra agrees: "Sleep is critical. Sleeping in a strange bed is never as good as sleeping in your own bed. But, it's important that you get your required amount of sleep at home and when traveling. It can be tough, especially if there's a time difference. Aim for seven to eight hours of sleep each night." Ficarra also recommends avoiding caffeine, alcohol and large meals before bed. Adjusting the temperature in your hotel room is another valuable hack. Choose a comfortable sleeping temperature between 19°C (67°F) and 16°C (60°F) to feel refreshed and ready to go the next morning. I want to thank Barbara Ficarra for all of her recommendations featured in this post. By putting our hacks into action today, you'll be ready to conquer your entrepreneurial goals while maintaining an optimum mind-body balance!